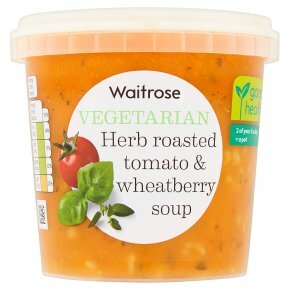 INGREDIENTS: water, herb roasted tomato (27%) (tomato, rapeseed oil, dried thyme, ground fennel, dried basil), onion, wheatberry (6%) (water, wholewheat), roasted red pepper, single cream (milk), passata, tomato paste, carrot, celery, extra virgin olive oil, garlic purée, sugar, rapeseed oil, parsley, cornflour, salt, red pepper, sunflower oil, tomato concentrate, olive oil, black pepper, dried thyme, dried basil, garlic. Gentle heat 7 - 8 mins. Empty contents into saucepan. Heat gently, stirring occasionally, until piping hot. Do not allow to boil. Stir before serving. Do not reheat once cooled.